This high quality 2-ply fringe is the all important skirting you need to give your float the appearance of gliding. 10' length x 15" drop. 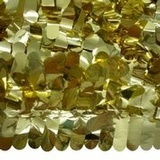 Shiny metallic fringe adds sparkle and bling to your float especially for night parades. Top with Twist to add finishing touch. 10' length x 15" drop. Novelty Color Combos: Red/White, Red/White/Blue, Iridescent (Opalescent), Prismatic (Holographic), Mardi Gras. Extra-long Fringe is ideally used for high trailer beds. Eight colors to choose from. Great for raised trailer decks, it's 12' long x 30" drop, made of flame-resistant, 2-ply vinyl. Faceted fringe reflects and shines, easy to manage 3' lengths x 30" drop. Standard Vinyl Floral Sheeting is used to cover large areas of your float such as the deck and structures on the deck. Use Metallic Floral Sheeting to cover large areas of your float, metallic adds extra sparkle and bling. For a different look, this Metallic Floral Sheeting has 'fingers' of petals. Candy Cane, Mardi Gras, Prismatic/Holographic, Rainbow, Red-White-Blue, Snowstorm, Opalescent. Grass Mat Sheeting is perfect to simulate the appearance of grass on sports floats. Two popular patterns - Red Brick and Greystone - to cover structures on float. Where it is impossible to staple, use double sided tape on vehicles or metal trailers to attach decorations. Magnetic tape can be used to adhere decorations such a fringe to a metal trailer or car. Line your parade route with pennants or use on your float. Cost effective way to represent any kind of event. Multi-Colored, Red/White, Orange/White. Bright flakes of Glitter can be applied over glue or paint for attractive effects on Cut Out Letters. Nine metallic colors. Displays different colors when viewed at different angles. Use it to create scales, water, jewels, etc. 8" x 30' length. Scaled Carpenters Drawings assist in construction of float structures. See our Float Design Page for a complete list. Call 1-800-665-5110 for a more detailed explanation of each design or a quote. Different shapes cut from coroplast that can be plain, painted or glittered: Circles, Stars, Crowns, Diamonds, Maple Leaf.